Way back when, before The Song of Ice and Fire series, bestselling author George R. R Martin was a big guy in Hollywood, working on the new Twilight Zone series, as well as a writer for the Beauty and the Beast TV series. Doorways is the show that very much almost, but ultimately never was. The pilot was filmed and in the process of final editing, but was never given a slot for airing . . . disappearing into the vault of dead shows. Martin still feels sad and very attached to this story, as he indicates in his introduction. Now he has brought it back to life, in a sense, with art from Stefano Martino, in the form of a graphic novel. The story opens with the main character, Dr. Thomas Mason, who is an ordinary man with an ordinary wife living in an ordinary life. But all that changes when a doorway opens up in the fabric of reality and an incredible, young woman named Cat steps into his life and steals his mind and perhaps his heart, as he is dragged along on the adventure of his life. Cat has the ability to travel through these doorways, taking one to different places in time and space within the blink of an eye. The problem is that there are beings after Cat, looking to stop and kill her, so she has to keep running. With Mason’s help she passes through a doorway and Mason finds himself potentially sealed off from his normal life in his normal world forever, but he doesn’t have time to waste, as there are creatures on his tail looking to wipe him out. 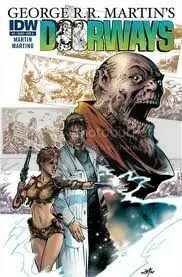 The story of Doorways is compelling, in the great science fiction way that Martin has delivered before, with a harsh and detailed art style from Martino, sucking you right into the story. The question remains if there will be any more stories to tell after this volume . . . only time will tell. Ben Templesmith is best known for his unique art style, especially in the 30 Days of Night series. In this third volume of Wormwood Gentleman Corpse he does plenty to introduce a new reader – like myself – who hasn’t read either of the earlier volumes to the main character. Wormwood is a species of ancient worm that has existed for a very long time, before humans began walking the Earth, accruing knowledge and information through a most unusual method: it inhabits the body of a corpse, bringing it to life. Anyone looking upon this decaying corpse sees whatever their mind chooses to invent, while any friends of Wormwood see the corpse and its little invertebrate inhabitant. In Calamari Rising, Wormwood thinks he might finally be getting some time to himself to relax and enjoy this world for a bit . . . then a giant, inter-dimensional wormhole opens up in the sky, letting in thousands of these flying octopus-like things. It doesn’t take long for Wormwood to recognize them as a very old foe, and they’re here to take over the planet and wipe out humanity. As his friends begin attacking these calamari creatures, Wormwood comes up with the only plan he can think off, launching himself through the wormhole and destroying it at the same time. That way there will be some hope for Earth, he thinks, and he’ll have to deal with whatever is on the other side. Wormwood Gentlemen Corpse: Calamari Rising is an entertaining graphic novel, with Wormwood as an unusual and interesting central character. The art style is classic Templesmith which is itself also unusual and interesting, catching any graphic novel reader’s eye in an instant. To purchase a copy of Wormwood Gentleman Corpse: Calamari Rising from Amazon, and help support BookBanter, click HERE. After an incredible undertaking, with much conferring with the original creator Clive Barker, writer Chris Ryall and artist Gabriel Rodriguez have finally finished the complete story of the epic Great and Secret Show, now released in paperback in its complete form. With a brief but proud introduction from Barker, who has nothing but good and great to say about Ryall’s and Rodriguez’s work, and the hopes that they will do the same to the sequel, Everville. 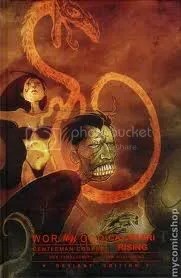 The Complete Clive Barker’s Great and Secret Show is a great tale the likes of which you will not read anywhere else, brought to life in beautiful graphic fashion. Randolphe Jaffe is a loser who’s going nowhere fast, that is until he gets a job for the post office working in the dead letter room in Omaha, Nebraska – the nexus of the country where all lost and undeliverable mail ends up. Going through thousands of pieces of undelivered mail per day – money and everything of value is surrendered to his boss – he begins finding clues of an undiscovered power in existence beneath the realm of society. It takes time, but he puts the pieces together until he has a good idea of this power known as the Art, where he then receives a medallion, the very symbol of the Art. While it means little to him at first, he knows it is an important piece of the puzzle. Naturally, his boss wants the item and it is then that Jaffe takes the first step down his new path and kills the man in cold blood. Collecting the important evidence together, with the medallion, he travels across America, living on the whim of the Art, letting it guide him where it will. Innocent bystanders are used by him, sensing the power of the Art and agreeing to whatever Jaffe tells them. It is in an alcohol- and drug-infused stupor that Jaffe conducts his pilgrimage into the desert and finds the Loop: a place out of time, and meets Kissoon, the last member of the Shoal. The Shoal was the group appointed to protect the Art. For the world is part of the Cosm, and beyond this is the Metacosm where the sea of Quiddity lies – a place visited by all when they are born, the night with their first love, and when they die – and within Quiddity lies the island of Ephemeris, the dream land. More importantly at the far edge of the Metacosm lie the Iad Uroborus, a great evil that is always looking to consume the Cosm. The Art is a way of getting to Quiddity. Kissoon tells Jaffe that he must occupy his body so he can leave the Loop and defend the Cosm. Jaffe suspects otherwise and flees, embarking on his own mission of discovery with Richard Wesley Fletcher as they research the Art in its entirety. Fletcher soon discovers a liquid form of the Art known as nuncio, testing it first on a chimpanzee who becomes a human with the ability of speech and thought, known as Raul. The nuncio will force the being to the next evolutionary step, but Richard also knows if Jaffe were to use it, it would focus on his urges of murder and revenge, making him into a serial killer. But it is too late, for Jaffe discovers the existence of the nuncio and in a fight both are infected by it and become higher beings – The Jaff and Fletcher. And then a great war is fought in the skies of America between these two gods of power until they are spent and plunge into a lake in Palomo Grove, California. There they both rest until four unsuspecting girls go swimming and are inseminated by The Jaff and Fletcher to create subjects to regain their power. And so the town is irrevocably changed forever as the four girls are all changed, becoming pregnant, giving birth to the offspring of these deities. Only three survive: a son of Fletcher and twins of The Jaff, and it is when, years later, that Fletcher’s son and The Jaff’s daughter meet and fall in love at first sight that the gods are awakened and the town takes a turn for the worst. Using the life-force of a recent victim, The Jaff is able to regain his power and begins collecting minions that he calls terrata from the people of Palomo Grove, sucking out their souls and using their rage, evil and anger to fuel his creatures. Fletcher is left with the dregs and is barely able to leave the crevasse where the lake used to be and find out what has happened to his son; then in a heroic effort, he gives up his life, spreading his power through the minds of the people of the town, who then have their dreams of meeting celebrities come true. These are the allies who must battle against the terrata in the mansion on the hill. With help from a pulp reporter, Grillo, and his friend, Tesla, Fletcher’s son Howard with The Jaff’s daughter – who despises her creator – confront The Jaff and his son in the big showdown. Only the evil god takes it all to a whole new level when he rips a hole in the fabric of reality with the power of the Art, opening a widening doorway to Quiddity. Soon everything in the room is being sucked into this other realm, with only The Jaff, Grillo and Tesla making it out of the room alive. As the rest of the world comes to comprehend the catastrophic events taking place in Palomo Grove and take notice, a decision must now be made with how to solve this whole horrible mess, as the Iad Uroborus are on their way at high speed to pass through this rip and take over the world. Time is of the essence, and Tesla – who has visited Kissoon herself – puts it all together and manages to move this trans-dimensional hole to the land of the Loop where time is stuck. Realizing that Kissoon chose Trinity, New Mexico – the location of the first detonation of the atomic bomb, where no one would think to check – she must kill Kissoon, who has already broken free due to his taking over of Raul’s (yes the evolved monkey) body, and with Kissoon gone, all that remains in the Loop is Raul’s body. The only solution, which Tesla goes forward with, is for Raul to occupy her body: two spirits, two consciences in one body, but it works. The Loop collapses, time starts moving again and just as the Iad Uroborus begin spilling into this world, there is the bright light and giant mushroom cloud, and the world is saved this time, but the power of the Art is not over. With this incredible story to tell, Ryall and Rodriguez have outdone themselves, bringing the people and places, the creatures and creations to life in a visual medium. As Barker says in his introduction: “This is no longer my Great and Secret Show . 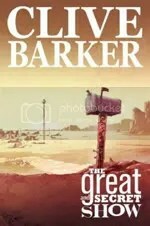 . . They’ve given life to my words.” For Barker fans, this is a wonderful adaptation to discover and enjoy; for non-Barker fans who enjoy the medium of the graphic novel, this is a perfect introduction to Barker’s incredible imagination, brought to life under the pen of Ryall and the brush of Rodriguez. The Complete Clive Barker’s Great and Secret Show is an incredible and fantastic journey that once discovered and begun, readers will be unable to stop until they reach the last glossy page. Originally written on December 22nd, 2007 ©Alex C. Telander. It’s always interesting to see how graphic novel adaptations of complex and long books are going to turn out. Thankfully, Ryall’s and Rodriguez’s adaptation of Barker’s book is one that he can be proud of, and will make fans happy. For a summary of the novel, see my review for The Great and Secret Show. The key here is that this is the first volume in an at least two-volume series, because the forty or fifty pages would not be able to cover the whole story. What’s so refreshing is the art. Clive Barker has a very vivid imagination and to see these crazy and complex images show in art form, rich with color and detail, is a truly enjoyable experience. Along with a brilliantly written script that manages to condense a six hundred page book – or three hundred in this case – into this slim graphic novel. Clive Barker’s The Great and Secret Show is perfect for the fan of the book looking to see it done in a whole new way, as well as those not sure if they want to tackle a long dense book, and looking for a Cliffnotes version. Of course, once they’ve read it, they will probably want to read the novel version, which of course is highly recommended. Originally written on April 5th, 2007 ©Alex C. Telander.